Welcome to the new site. Or the, uh, old site. In the late 1990’s, I ran a site called Alton Online which was located at www.alton-online.com (yeah, another hyphenated site) and featured writings on Alton, Illinois. Along with that site, I distributed a paper newsletter, mostly about the Alton computer scene which was carried at all the area libraries, grocery stores, computer shops, etc. After a year of not even breaking even with it, I got bored and quit. The purpose of it was to sell ads in the newsletter, which we didn’t sell much of at all. After that, I stopped taking the web site so seriously and turned into a comedy site based on things in the Alton area. I started posting humorous pictures and writing about things around town. I complained about things and promoted the pranks that EvilCal and I pulled. I guess it was basically my blog before I had a blog. I think it was in 2002 that EvilCal had this great idea of turning Alton Online into an ISP. He would set up the hardware end of it and I would try to get local customers for it. We would split the profits and I would get free dialup internet in return. So I sent Cal the domain name, he never did anything with it and it expired. Thanks, Cal! A domain squatter immediately picked it up and put a bunch of paid links on it. A friend of mine, who was an aspiring stand-up comedian, frequently used a joke in his act that went something like, “I’m from a small town called Alton. Ever hear of it? Didn’t think so. You know what Alton is spelled backwards? Not L.A.” That actually got laughs. Anyway, I stole his joke for my new site and notla.com was born. All the old Alton Online content went onto it and I continued to slowly add more. But once I decided that I was moving to Oregon, I didn’t see much point in continuing a website about a town thousands of miles away from me. For the past 2 years, notla.com hasn’t seen much change. 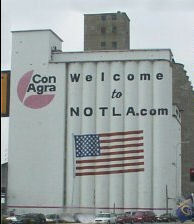 You can see what the site looked like before today by going here: http://www.notla.com/sites/altononline. I had two evil plans for Alton Online that I never got around to completing. The first was this – I was going to write a very serious article about a retired old man on a farm who decided to build a life-sized replica of downtown Alton on his property. I visited downtown Alton early one holiday morning when the streets were completely empty and snapped dozens of pictures of the buildings surrounded by empty streets, bare parking spaces and no people. I also took pictures of some corn fields. My plan was to do some photoshopping to make it look like a few blocks of Alton had been replicated in the middle of a field. I could show a road abruptly ending where a grass field began. Instead of seeing the Mississippi in the distance, you’d see corn fields. From another angle, down a bare Alton street, you’d see a farm house where the rest of downtown Alton was supposed to be. I’d tell a heartwarming story about how the man used to be into model railroading, but wanted to build something bigger on his acres of land and decided on a full-sized model of Alton, Illinois. My hope was that people would actually believe this and that some might even drive along the road that I mentioned it was on, keeping a sharp lookout for Alton in the middle of a field. The emails I would get from people calling my bluff or begging to know where it was located would make me laugh several times a week. Sadly, we’ll never know how great it could have been. Evil Plan #2 – Urban exploration of the vast collections of sewers, tunnels and caves beneath the city of Alton. I collected a bunch of pictures of cool tunnels and drains from legitimate urban exploration sites that I planned to use. Of course, there’s nothing interesting underneath Alton. But I planned to change all that with some photoshopping and lies. I was going to list some specific entrances and show all the amazing pictures of this hidden underground city. It would put the abandoned NYC subway tunnels to shame. In the end I would probably be responsible for some kids climbing into sewers and dying. Is that hilarious or what?? So that’s the history and would-be history of Alton Online and www.notla.com. The word is essentially meaningless now that I don’t live in Alton anymore, but I’m keeping it anyway. Welcome to my homepage!